Since commerce began, CEOs and owners of businesses have struggled to get their workforce to understand the financial side of the business -- why we need profit, why we can't distribute all of it, where the money goes, etc. In fact, some owners have trouble themselves when they get past the income statement. A P&L is pretty straightforward. In fact, I talked with a person whose business failed this past year, and he said, "I understood my P&L pretty well. What I didn't understand was my Balance Sheet -- I think that's what did me in". PS: He's right about that. I recently needed to explain the relationships between the P&L and the balance sheet to a group of senior and middle managers, and was looking for a metaphor that might "stick" better than just walking through the numbers. Here's what I came up with, and I'm hoping it might be useful to you in explaining the same thing some day. There's an amazingly direct relationship between aviation and business. Flying an airplane is a whole lot like running a business, if you understand the correlations. What are some of those? Direction = Strategy -- We're making good time. Are we going to end up where we want to be? Airspeed = Revenue (sales) -- What keeps an airplane flying is air rushing over the wings, providing lift. In fact, lift is directly proportional to airspeed. There's also a critical airspeed at which the airplane stops flying -- the stall speed. Altitude = Available Cash -- The game-over point in flying? Premature contact with the ground, otherwise known as a crash. Altitude = 0. Same in business -- game-over occurs when cash = 0. You only get to run out of money once. You can come close to running out of money lots of times. 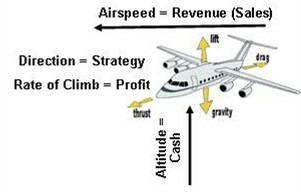 Rate of Climb = Profit (or more accurately, cash flow) -- If you're losing altitude, recovery requires either of two things -- more airspeed (sales) or reduced weight in the airplane. Lift stays the same and you gain altitude. How do you reduce weight in the airplane? Throw the luggage overboard (jettison expenses). They have stores where you're going, and you can buy more clothes. If you're carrying mail, throw that overboard (eliminate non-essential activities). Those people will get over it -- they'll just send those letters again. Pick a non-essential passenger and throw him overboard. Not pleasant, but could mean the survival of the rest of the party. You can figure out that part of the metaphor. There are a couple of other ways to solve an airspeed problem, such as more thrust. More energy applied to the business. Or more energy applied directly to Revenue generation. You could also reduce drag -- eliminate mistakes, outsource non-core activities, increase productivity or automate. The most useful part of this metaphor, I believe, centers around the most critical tradeoff in flying. That's the tradeoff of altitude for airspeed. When airspeed slows, lift is reduced, rate of climb becomes negative, or if you try to maintain altitude, you'll stall. So, you point the nose down and let gravity help you maintain airspeed above stall speed. 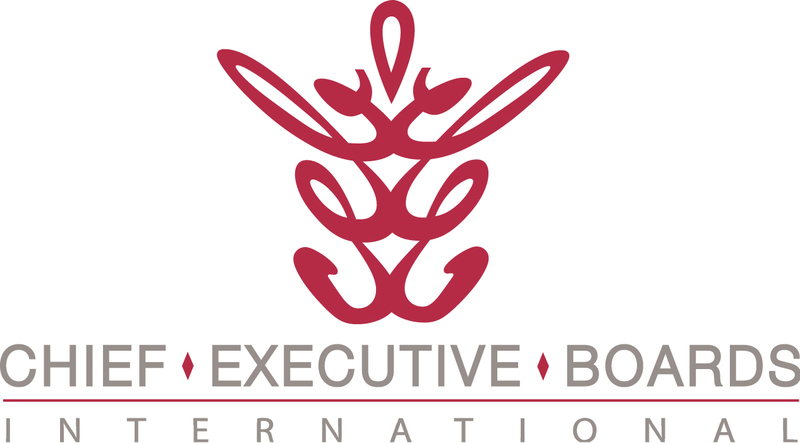 Business equivalent? You settle for less profit, or even a loss to maintain airspeed. This will work for awhile. How long? Until you run out of altitude (cash). When altitude = 0, game over. If you're losing both airspeed and altitude, you've got to come up with ideas -- usually pretty quickly. The best recent aviation example of ideas overcoming loss of airspeed and altitude is the "Miracle on the Hudson" -- the story of Flight 1549. In that story, Captain Sullenberger maintained critical airspeed, sacrificed altitude, and came up with an amazing number of ideas, just in time to become a hero. If you have metaphors or word pictures you've used to help your workforce understand the business, please click on "Comments" below and share them with others. "You never want to run out of airspeed, altitude and ideas all at the same time"